May marks the start date of all the local farmers markets here in Northern California, so I have simple, fresh recipes on my mind. If you can find fava beans at your local market, get those for the pasta dish. If you can't, edamame is a worthy high-protein substitute. I only recently discovered fava beans at a local restaurant and fell in love. They epitomize springtime and have a fresh nutty taste. And if you're in a pinch, you may use frozen broccoli in the frittata recipe. It's easy to roast straight from its frozen state. Just dump on the baking sheet and toss in the oven! Enjoy! A simple, light spring dish full of protein and complex carbohydrates to keep you full and satisfied! This dish takes less than 20 minutes to prepare, and it requires almost zero cooking, making it perfect for those nights you just want to reach for the takeout menu. Cook the pasta in a pot of boiling salted water. Drain and reserve pasta water. Set pot back on the stove and cook the frozen edamame in the same water for six minutes, or until heated through. Set aside. In a large bowl, combine the cooked pasta, edamame, arugula, Parmesan cheese, and olive oil and toss well. Season with sea salt, pepper, and red pepper flakes and serve immediately. I love to pack these wraps in my lunch bag or picnic basket, as they don't require refrigeration. This recipe is perfect for kids who don't like cold cuts (many schools don't allow peanut butter). Lay each tortilla down on the counter and spread with about two tablespoons of hummus. Lay two slices of tempeh on the hummus and then stack on the veggies. Roll up carefully, slice into two, and secure each half with a toothpick. These are very simple to make and easily wrapped in plastic wrap or aluminum foil for lunch boxes! Who doesn't like eggs for dinner? Though I must admit, I think my favorite way to eat this delicious frittata is when it's cold, the next day, in a wrap! Preheat your oven to 375 degrees. Spread the broccoli out on a baking sheet and roast for about 15 minutes, or until broccoli just starts to turn a golden brown. Stir occasionally. After broccoli has roasted, remove and reduce oven temperature to 350 degrees. In a medium bowl, crack the eggs and egg whites and beat well with a whisk. Add the sea salt, pepper, and red pepper flakes and stir well. Next, heat up your cast-iron skillet over medium-high heat. Melt the butter in the pan and then spread out the roasted broccoli along the bottom. 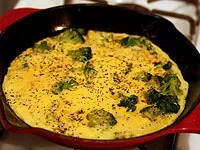 Pour in the eggs and gently move the pan around so that the eggs cover the entire bottom of the pan and all of the broccoli. Now sprinkle the cheese evenly all over the top of the eggs. Let cook for about 4 minutes, or until the eggs have just set. Move the skillet from the stove top to oven and bake for 4 to 5 more minutes, or until the top of the frittata has started to turn golden brown. Remove from oven, let cool, and then slice into 4 large slices. Serve with a salad and fresh bread.